Welcome to In the Footsteps of Phoebe! In the Footsteps of Phoebe: A Complete History of the Deaconess Movement in The Lutheran Church - Missouri Synod is available from Concordia Publishing House (St. Louis, MO). This site includes hundreds of illustrations, a book synopsis, comprehensive bibliography, book reviews, and extended quotations not found in the book. We expect these features to expand and grow in conjunction with the interests of readers. The author's blog and a Woman of the Week column provide discussion venues for any browsers who would like to join in. Since reading, writing, and editing are sort of a hobby/passion/obsession, I've been pleased to have more than the usual amount of time to do these things lately. The reason, though a somewhat painful one, is that on Sept. 12, 2015, I fell backward off of a stage and sustained several fractured bones in my right foot. Since surgery on Sept. 24 things have gone well. Physical Therapy started two weeks ago. One more surgery early in December will be the last, and then another period of some weeks of recovery. I decided from the start that if Martin Luther could translate the Bible into the German language while secluded at Wartburg Castle, I could likewise be somewhat productive while just sitting around with my foot elevated above my knee! This decision has helped me get through many a long day, though I'll admit to cat-napping during the process. In this week of Thanksgiving, I am grateful to God for doctors, nurses, surgeons, medicine, a loving and caring family, a loving and caring church, a loving and caring sisterhood of deaconesses in Concordia Deaconess Conference, and of course, the salvation that God has so freely given to us! May you have a blessed Thanksgiving, in Christ! 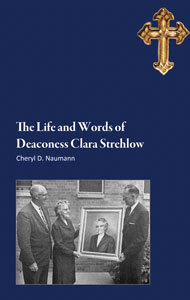 One of my recent joys was to finish the biography of Deaconess Clara Elsa Flora Strehlow (1895-1985).